A business letter is a formal document often sent from one company to another or from a company to its clients, employees, and stakeholders, for example. Business letters are used for professional correspondence between individuals, as well. Although email has taken over as the most common form of correspondence, printed out business letters are still used for many important, serious types of correspondence, including reference letters, employment verification, job offers, and more. 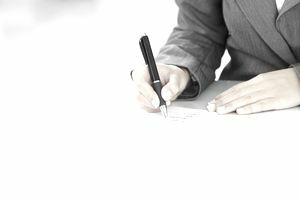 Writing an effective, polished business letter can be an easy-to-follow task, so long as you adhere to the established rules for layout and language. Realize that your recipient reads a significant amount of correspondence on a regular basis and will favor well-executed letters that are free of typos and grammatical errors. A good rule of thumb is to proofread it twice and then have a colleague review it to ensure nothing was missed. Each section of your letter should adhere to the appropriate format, starting with your contact information and that of your recipient’s; salutation; the body of the letter; closing; and finally, your signature. Below is the traditional business letter format, with tips on how to frame it based on your relationship with the reader and what your desired outcome is. Use "To Whom It May Concern," if you’re unsure specifically whom you’re addressing. Use single-spaced lines with an added space between each paragraph, after the salutation, and above the closing. Left justify your letter (against the left margin). Make the purpose of your letter clear through simple and targeted language, keeping the opening paragraph brief. You can start with, “I am writing in reference to…” and from there, communicate only what you need to say. The subsequent paragraphs should include information that gives your reader a full understanding of your objective(s) but avoid meandering sentences and needlessly long words. Again, keep it concise to sustain their attention. If your intent is to persuade the recipient in some way, whether it's to invest money, give you a reference, hire you, partner with you, or fix an issue, create a compelling case for your cause. If, for example, you want the reader to sponsor a charity event, identify any overlap with their company’s philanthropic goals. Convince the reader that helping you would be mutually beneficial, and you will increase your chances of winning their support. Keep your closing paragraph to two sentences. Simply reiterate your reason for writing and thank the reader for considering your request. You can use this business letter sample as a model. Download the template (compatible with Google Docs and Word Online), or read the text version below. I would like to invite you to attend our upcoming Liberal Arts department job networking event. The event will be held on the afternoon of February 1, 20XX. We wish to provide our graduating seniors with an opportunity to meet business leaders in the area who may be looking for new hires who hold degrees in the Liberal Arts. The event will be held at the Cox Student Center at Northern State University, and will last about 2 to 3 hours. If you have an interest in attending or sending a company representative to meet with our students, please let me know at your earliest convenience and I can reserve a table for you. ﻿Thank for your time and I hope to hear from you soon. Include the topic you're writing about in the subject line of the email, so the reader is clear as to why you are sending the message. You can find more detailed tips in these guidelines for how to write a business letter, including choosing a font, selecting margins, and formatting your letter properly. It's always helpful to look at examples to get ideas for your own correspondence. Review letter samples, including cover letters, interview thank you letters, follow-up letters, job acceptance and rejection letters, resignation letters, appreciation letters, and more business and employment-related letter samples.